Straighten Your Teeth with the Invisalign® Clear Braces Solution Get a beautiful smile without uncomfortable metal braces. Many patients choose to straighten their teeth with Invisalign instead of traditional braces because the clear braces method is so discreet. If you are self-conscious about your appearance and do not want people to notice you are undergoing orthodontic treatment, Invisalign may be perfect for you. Your teeth will gradually shift into their new positions with the gentle pressure applied from the aligner trays. You will feel minimal discomfort during this process and can look forward to a beautiful new smile in a matter of months. 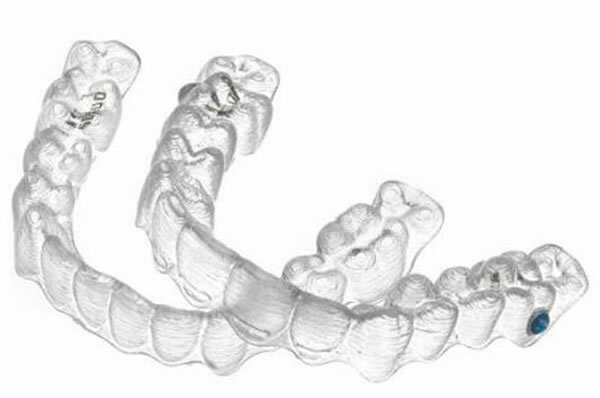 The Invisalign clear braces solution is an attractive alternative to metal braces and is completely customized for the patient. Dr. TJ Imm is an authorized provider of this orthodontic treatment and will make sure you achieve lasting results in the shortest amount of time possible. We use a special software program and digital technologies to take impressions of your teeth before having a lab make your set of aligner trays. You will receive a new set of aligners every few weeks as your teeth move into their new position. Get the beautiful smile you have always wanted without metal braces. Learn more about Invisalign® by scheduling your appointment at 5 Points Advanced Dentistry today!